Julie Sheldon trained for 15 years to become a ballerina. However, a fall during rehearsal, a skiing accident, meningitis and finally the diagnosis of Dystonia, a rare neurological disease, all tested Julie's Christian faith. This book tells her life story. - Publisher Julie Sheldon trained for 15 years to fulfil her longing to be a ballerina. Chosen for a coveted place at the Royal Ballet School, she realised a dream by dancing at the Royal Opera House, Covent Garden with Margot Fonteyn and Rudolf Nureyev. Then things began to go wrong - a fall during rehearsal, a skiing accident, meningitis and finally the diagnosis of Dystonia, a rare neurological disease. Julie's Christian faith was tested to her limit. This book tells her story and the story of her dramatic healing. 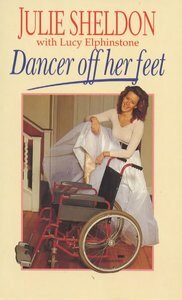 About "Dancer Off Her Feet"
Julie Sheldon trained for 15 years to fulfil her longing to be a ballerina. Chosen for a coveted place at the Royal Ballet School, she realised a dream by dancing at the Royal Opera House, Covent Garden with Margot Fonteyn and Rudolf Nureyev. Then things began to go wrong - a fall during rehearsal, a skiing accident, meningitis and finally the diagnosis of Dystonia, a rare neurological disease. Julie's Christian faith was tested to her limit. This book tells her story and the story of her dramatic healing. Sheldon is Programme Leader in Art History at Liverpool John Moores University.